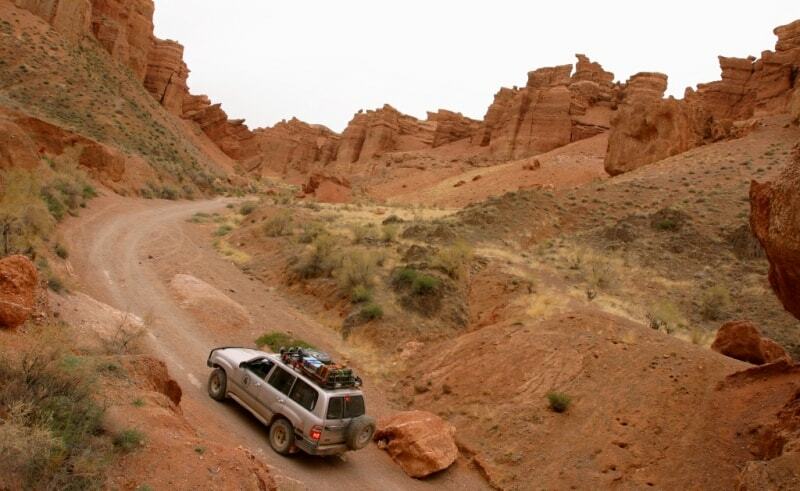 Tours on jeeps across Kazakhstan. Canyon of Charyn mountain river is one of the most popular tourism destinations across the Almaty region. Although this influx of the Ili River flows enough far from the city (220 km), all the guests of the southern capital come here at any first possibility. Fantastic picture of brown striped almost vertical towering canyon walls produces a great aesthetic experience. Making the existing here national park the Geopark status will help visitors to learn a lot about the geological history of these rocks. 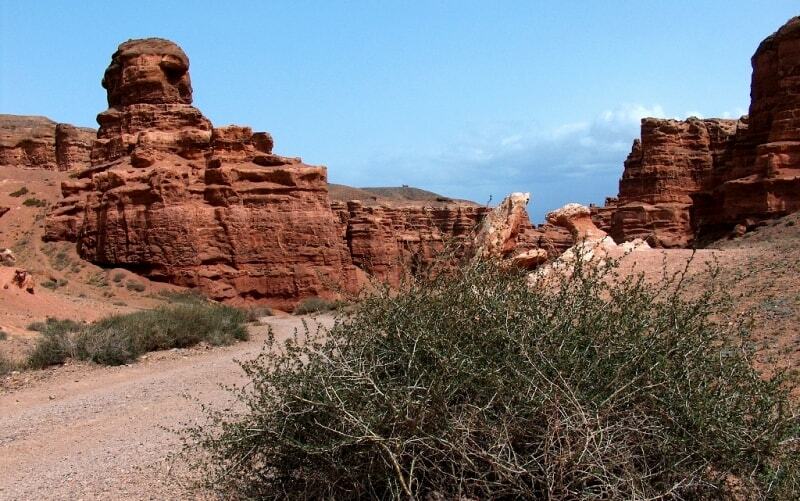 Charyn State National Park is one of the youngest reserves. It was created on 23 February, 2004 on an area of more than 90 thousand hectares in order to preserve the unique natural complexes with special ecological, historical, scientific, aesthetic and recreational value. Here grow rare species of flora: Sogdian ash, poplar - Afghan, sileaves, heterophyllous, Ili honeysuckle, Semenov maple, saxaul and others. Fauna includes 24 species of mammals, 48 species of birds, 3 species of amphibians, 14 species of reptiles. 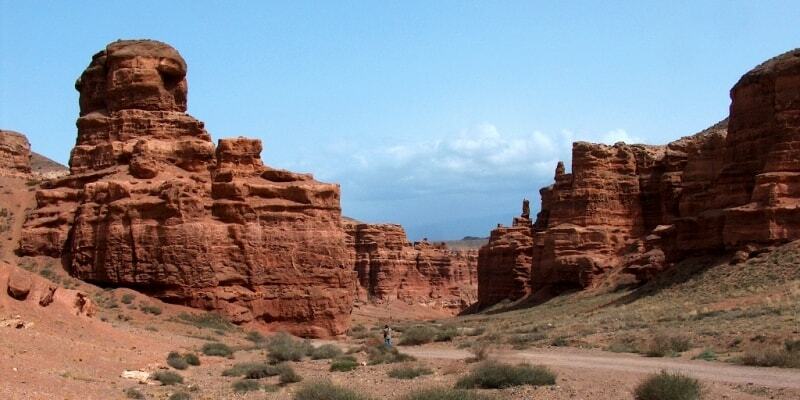 The most popular tourist destination for visitors in Charyn National Park is the “Valley of Castles”. It is a network of picturesque canyons as deep as 300 meters with the exotic relief, consisting of a number of fantastic shapes, carved by the river in horizontal layers of Miocene carbonate-terrigenous strata, containing interesting paleontological remains. In the walls of the canyon numerous slides, faults and thrusts can be clearly seen, which cut the Miocene strata and much more ancient deposits of Toraigyr suite of Early Carboniferous. All this combined present a stone record of geological history: the growth of mountains, formation of intermountain depressions, tectonic movements. In the Toraigyr mountains a number of testimonies of the Paleozoic geologic history can be observed. Here the stratotype of carbonate-terrigenous deposits of Toraygyr suite of Lower Carboniferous is studied, where the overlap of basal conglomerate-breccia of Lower Toraigyr subsuite to Ordovician granitoids is clearly observed. Above lie variegated sandstone, siltstone, algae limestone of Lower Toraigyr subsuite and pink, lilac, fawn rhyolitic tuff and ignimbrite with horizons of sandstone, limestone and flint of the Upper subsuite. This stratum is crumpled into folds and is broken by Late Paleozoic dykes of andesibazalt composition violated by numerous manifestations of microtectonic. Jurt’s Valley presents unusual by shape outcrops of Ili suite of Middle – Upper Pliocene. 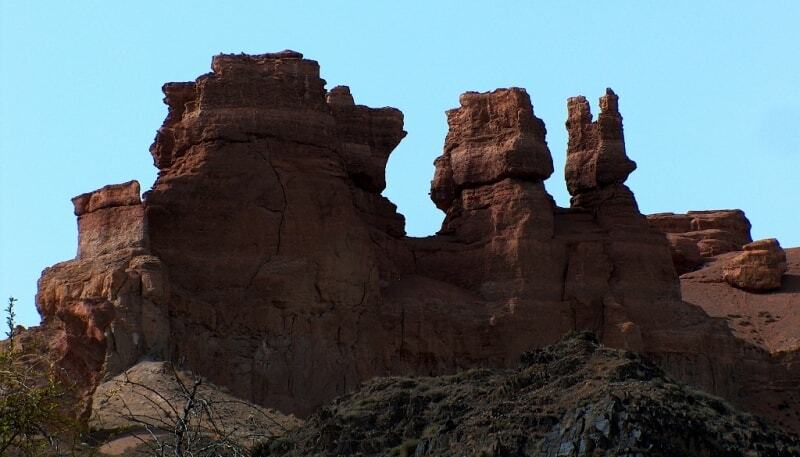 Their shape resembles the numerous jurts, placed along the walls of the canyon. It is hard to imagine that conventional yellow clay with layers of gray gravel and sand could create such an unexpected landscape. Under layers of Ili suite, we can see the familiar to us from “Valley of Castles” Miocene strata, which is drawn down to the Carboniferous deposits. Sometimes the Middle – Upper Pliocene strata lies directly on the Carboniferous volcanites. Below the gorge the Carboniferous rocks form the walls of the picturesque canyon, sometimes forming ledges on which the water running along the bottom flow in the form of small waterfalls. 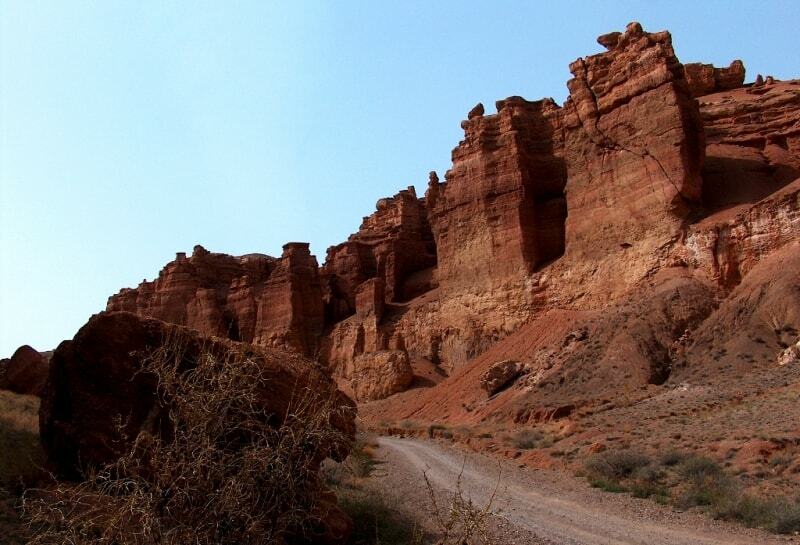 The “Small Canyon” is formed by the right tributary flowing into Charyn River, near Bestamak Mountain. Here are observed (from the head to the mouth): Miocene terrigenous-carbonate strata, overlying on a light-gray, very strong weathering crust. Then you can watch the beautiful outcrops of Carboniferous tuff with rounded blocks of volcanic rock. No less spectacular is ignimbrite strata, rocky outcrops of which resemble stone idols of Easter Island, compose the walls of the narrowest section of the canyon. “Ignimbrite” means “fire rain”. This rock is composed of particles of molten lava, raised in the air as a result of catastrophic explosions. Different sufficiently large fragments of lava (usually up to 5 cm, but sometimes up to 50) are observed in ignimbrite. The latest resemble in the cut a candle flame, so they are used under the term “fyamme” (“Flame” - Italy.). Then the canyon expands and in its right side volcanic-sedimentary strata with thin lenticular gray tuff horizon of about 2 meters is exposed. Further down the gorge there are spectacular outcrops of the various intrusive and volcanic rocks, and near the mouth of the canyon - the granite. It is the deep center of Carboniferous volcano, which was active 300 million years ago. In its depths we can deepen as we move towards the mouth of a dry riverbed. 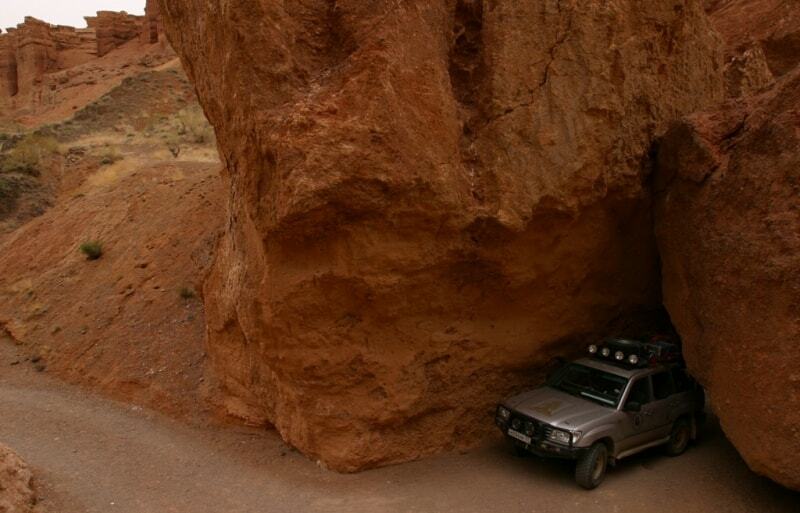 “Small Canyon” is the ideal venue for geological excursions. When compiling geo-tourism routes one should not forget that many interesting things could be seen in the adjacent areas as well. For example, near the mountain mouth of the river Temirlik there is a very spectacular outcrop of ophiolite. This rock complex (serpentinized pyroxenite, gabbro, and listvenite) represents the remnant of the Cambrian (540 - 500 million years) paleoocean. Details of its structure can be seen in the walls of the gorge Temirlik, although deep, but still available for excursions. To the south of the outcrop of ophiolite in cliffs the attention of tourists could be attracted by gauffering fillite shale and other schistose rocks of Silurian. Conglomerate of this strata contain pebbles of serpentinized ultrabasic rocks. They are rich in chromium, as evidenced by the abundance of fuchsite - chrome mica, painted in bright green color. In the mountains of Big Boguty, at the contact of flish sediments of Middle Ordovician with Devonian granite the tungsten deposit Boguty is located. Intercrossing of innumerable quartz veins (so-called stockwork) is concluded here into the halo of greisen – rock that appears under the influence of hot orebearing fluids. In the dumps of drifts collectors can find molybdenite, scheelite, pyrite, chalcopyrite. Here you can get acquainted with the stratotype of marine volcanic-sedimentary deposits of the Lower Ordovician, gray-coloured terrigenous strata of Middle and Upper Ordovician, brightly coloured volcanites of the Lower Carboniferous. All of them can be studied in the representative sections. 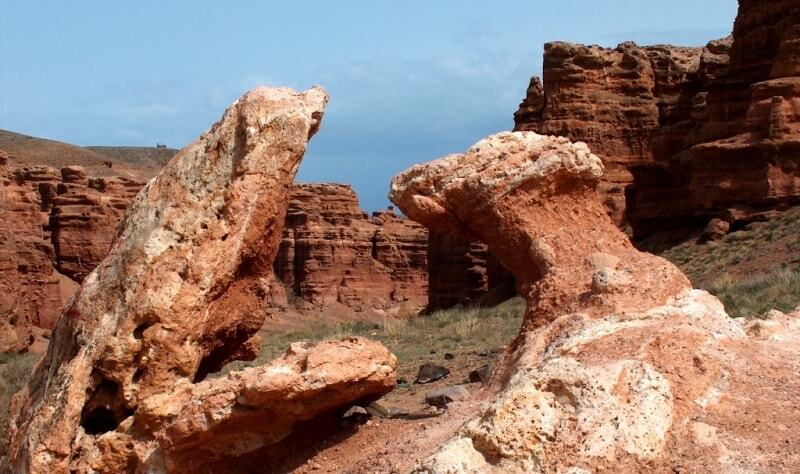 Territory of Charyn National Park is rightly regarded as a potential Geopark. Numerous tourists who come here, are attracted by the unusual landscapes of picturesque rocks. Stories about their geological history will significantly increase the interest to this wonderful corner of nature.